Book now, places limited. That’s the message from Marubeni-Komatsu as it prepares to put its ‘intelligent’ earthmoving equipment on show in Scotland for three days of demonstrations next week. Visitors will see company operators use the PC210LCi-10 excavator and D65PXi-18 and D61PXi-23 dozers to prepare the site before getting the opportunity to take the controls and put the machines through their paces. The Intelligent Machine Control System provides automatic ‘real time’ control that reduces operator error and eliminates or dramatically reduces the need for site staking. 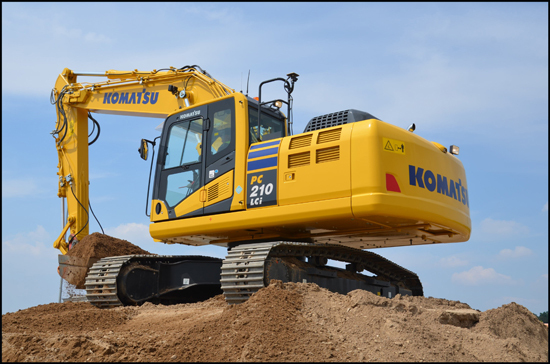 Komatsu says the system also improves site safety and efficiency. The demos will be held June 23, 24 and 25 at Beltmoss Quarry in Kilsyth near Glasgow and morning and afternoon sessions will run each day. Those planning to attend are advised to choose a date and session time and then email marketing@mkl.co.uk who will confirm the details. Places are limited. After Scotland, the demo team left for a series of similar events in England during July.